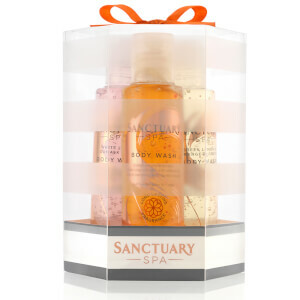 Indulge yourself with the Sanctuary Spa Lost in the Moment Gift Set, a skincare kit containing six sumptuous products. Bursting with nourishing ingredients and luxurious scents, the set works to uplift your senses and polish your whole body for an ultra-silky finish. A luxurious body scrub that blends Dead Sea salts with nourishing oils to polish and refine from top to toe. Helping to replenish vital moisture to skin, the scrub smooths away impurities for a super-soft and silky texture. Ideal for skin that is prone to blemishes and breakouts, the self-heating treatment infuses Charcoal and Kaolin Clay deep into the pores to draw out impurities, without stripping moisture. A dose of Myrrh Essential Oil soothes and calms to leave you with a clean, soft and comfortable complexion. Bath Soak: Pour generously under warm running water. Sink in & enjoy. Salt Scrub: Massage a generous scoop onto drenched skin & rinse off. For a more intensive result massage onto dry skin before stepping into a warm bath or shower to wash away the salts. Hand Cream: Massage this non-greasy, nourishing cream into hands throughout the day for velvety soft skin. Heel Balm: Massage this rich balm into dry skin using gentle circular motions. Detox Mask: Apply a thin layer over your face & neck after cleansing. Enjoy the warming experience & allow to cool naturally while you relax for 5 minutes. Rinse off with warm water & a damp cloth then pat dry. Bath Soak: Aqua (Water), Sodium Laureth Sulfate, Caprylyl/Capryl Glucoside, Cocamidopropyl Betaine, Sodium Chloride, Parfum (Fragrance), Phenoxyethanol, Sodium Benzoate, Citric Acid, PEG-250 Distearate, PEG-40 Hydrogenated Castor Oil, Polyquaternium-10, BHT, Tetrasodium Glutamate Diacetate, Butyl Methoxydibenzoylmethane, Tocopheryl Acetate, Sodium Hydroxide, Saccharide Isomerate, Propylene Glycol, Hydrolyzed Adansonia Digitata Extract, Freesia Refracta Extract, Carbomer, Hexyl Cinnamal, Linalool, Limonene, Benzyl Salicylate, Benzyl Benzoate, CI 15985 (Yellow 6), CI 14700 (Red 4), CI19140 (Yellow 5). Salt Scrub: Water (Aqua), Butylene Glycol, C12-15 Alkyl Benzoate, Myristyl Myristate, Potassium Cetyl Phosphate, Cetyl Alcohol, Cetearyl Alcohol, Stearyl Alcohol, Hydrogenated Palm Glycerides, Fragrance (Parfum), Phenoxyethanol, Dimethicone, Panthenol, Sodium Polyacrylate, Lecithin, Montan Wax, Butyrospermum Parkii (Shea) Butter, Cetearyl Glucoside, Polysorbate 20, Prunus Amygdalus Dulcis (Sweet Almond) Oil, Copernicia Cerifera (Carnauba) Wax, Ethylhexylglycerin, Tristearin, Aloe Barbadensis Leaf Water, Glucose, Citric Acid, Hexyl Cinnamal, Linalool, Limonene, Benzyl Salicylate, Benzyl Benzoate, Coumarin, Citral, Caramel, Yellow 5 (CI 19140). Detox Mask: Zeolite, Butylene Glycol, Glycerin, PEG-8, Kaolin, Dimethicone, Prunus Amygdalus Dulcis (Sweet Almond) Oil, Cetyl Alcohol, PEG-150, Cera Alba (Beeswax), Titanium Dioxide, Xanthan Gum, Carbon, Commiphora Myrrha Oil.